In the new era of Internet booming and talent-oriented innovation, female leaders not only play a significant role in community building, but also show critical value in the financial performance, social performance, innovation, and crisis management etc. of organizations. But overall, the current female leader representation is still insufficient. According to domestic data, in 2017, the labor participation rate of Chinese women has exceeded 70%, which is much higher than other countries. However, the percentage of women at the company’s board level is only 9.4%. From a global perspective, women account for only 20% of leadership positions and the proportion decreases as the management level rises. The female leadership value can be played on the premise that female talents are promoted to leadership positions; however, under the influence of society, culture and system, they may face difficulties in the workplace of female leaders. In business environment, most enterprises are still dominated by males. With the constraints of gender bias, the appointment of female leaders is still quite difficult in most enterprises except for the service industry which is closely connected with consumers. Therefore, the appointment of female leaders is particularly important in organizational practices. As two typical workplace situations for female leaders, symbolism appointment and emergency appointment have highlighted the significance of reexamining the changes in female leader representation, complementing the discussions on relationship between gender and leadership, and promoting gender equality in enterprises. The symbolism appointment of female leaders can be defined as an appointment motivation that only takes female leaders as gender representations. Less than 15% of the groups in organizations are symbolists; while the remaining groups are dominants in the organization who prevail in number and control the organization and also its culture. In the U.S., only 32 of the top 500 companies are controlled by women, and the proportion of female CEOs is only 6.4%. 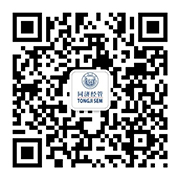 Among the boards of directors in Chinese companies, the proportion of female directors is 10.7%, of which only 5.4% of the boards of directors of A-share listed companies are chaired by women. Female leaders account for significantly less than 15% of companies worldwide, with men being the dominant players in organizations. Women are symbolists and have clear symbolic identities. This symbolism appointment is mainly reflected in three aspects: 1) The number of female leaders in the leadership group is low, and female leaders are highly visible in organizations – this high visibility brings performance and other pressures for female leaders; 2) Female leaders have relatively low gender status in organizations, and male leaders may deliberately raise gender boundaries and consciously alienate female leaders. This will further exacerbate the imbalance of power between men and women; 3) Society and organizations have gender bias against female leaders. Thus, they may encounter role distortion in organizations which is imposed by male leaders. The appointment of female leaders during an organizational crisis represents a kind of motivation for emergency appointments. The appointment of female leaders under such circumstances is termed as “glass cliffs”. For example, in July 2013, when Marissa Mayer took the position as the CEO of Yahoo, Yahoo was facing problems such as awkward financial situation, decreasing corporate income, decline in core businesses, and serious brain drain etc. In 2014, within a month of Mary Barra’s promotion to the CEO of General Motors, GM faced the organizational crisis of large-scale recall due to defects in ignition switches. Women who face the “glass cliff” have broken through the “glass ceiling” and thus are more likely to achieve leadership roles during periods of crisis, when the chance of failure is much higher. When Mayer and Barra were appointed, the organizational crisis had already arisen. However, after taking office, they had to bear the risks and responsibilities associated with inevitable crisis, and they were also suspected and criticized as individuals. This is a kind of unstable and high-risk situation. It is difficult for women to be treated equally in their work even if they break through the glass ceiling and are promoted to higher positions. They are given relatively less authorization and can hardly exercise power like men, and are unlikely to participate in a wide range of decision makings. Among the two typical types of female leader appointment: symbolism appointment starts from the gender identity of female leaders, and take it as a representative symbol of the female group; while emergency appointment focuses on the context of organizational crisis, and considers the appointment of unconventional leaders as a signal of organizational changes. The former situation can easily cause female leaders to behave like “queen bees”,i.e. alienating female staff and adapting to the masculine culture; while the latter pushes female leaders onto the “glass cliff” and makes them the “scapegoat” for organizational crises, having to bear high risks and pressures. Female leaders accept symbolism appointment which promotes the further continuation of unreasonable organizational gender order; and female leaders who are appointed in emergency situations need to bear high failure rates. The failure of female leaders will even lead to external attribution bias and deepening of gender prejudice. Compared with the “glass ceiling”, after female leaders break through the “glass ceiling” and are promoted to leadership level of the organization, they will face the challenges of assimilation by dominant group, higher pressures and so on. The role of “queen bees” brings about the alienation of female groups, which further hinders most women from breaking “glass ceiling”. Taking emergency appointment as the opportunity for promotion, female leaders are in difficult situations on the “glass cliff”, and the “glass cliff” has become another kind of “glass ceiling”. 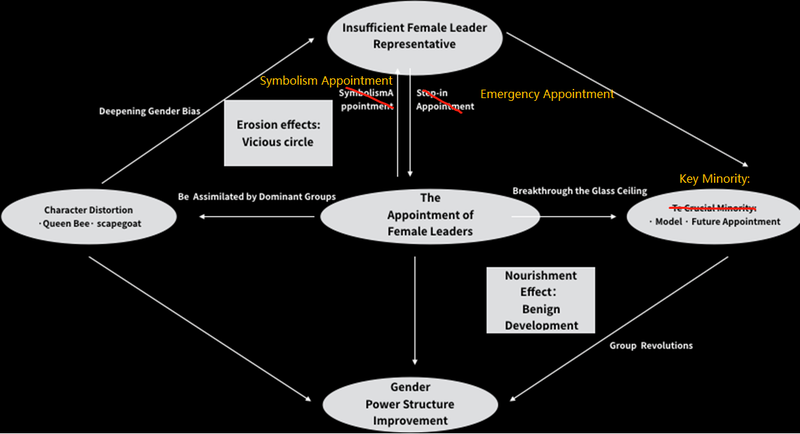 Meanwhile, symbolism appointment and emergency appointment will also affect individual role playing and behavioral performance of female leaders in organizations, and the chain effects of the relationship between female group and organization dynamic environment (as shown in Figure 1). This effect needs to be considered in terms of both negative erosion and positive nourishment. First, in the context of insufficient representation of female leaders, both symbolism appointment and emergency appointment are not based on women’s values. Therefore, in male-dominated organizations, this “nominal” appointment will make female leaders act as “inferior representatives” in dominant groups, trigger role distortion, and further deepen the gender bias, thus leading to a vicious circle of insufficient female leader representation at the top of the organization. Second, under the influence of long-term social and cultural background, it still needs a long time before the status quo of insufficient female leader representation is improved. Through these two kinds of appointments, some female leaders could also get an opportunity to break through the glass ceiling and get professional promotion. As “key minority” of the female group in organizations, the appointed female leaders could play an active demonstration role and become models for women at the grassroots level, and promote the construction of future female talent teams in enterprises, namely the nourishment effect. In the real-life organizational context, the motivations for symbolism or emergency appointment exist in both domestic and foreign organizational practices. Compared with the verification of phenomenal existence, it is more important for enterprises to deal with the chain effect caused by the appointment of female leaders, namely, to reduce the “erosion” effect and release the “nourishment” effect. First of all, in male-dominated organizations, we should establish a standardized and transparent selection mechanism of high-level leaders, attach importance to talents’ capabilities and advantages, and try to avoid such phenomena as “symbolism” and “emergency” appointment, which may erode the balanced development of future gender and power structure of the organization’s senior management. Secondly, the organization should attach importance to the value of female leader appointments, rethink the achievements in promoting gender diversity and increasing the proportion of women in senior positions and board of directors, help alleviate the pressure of female executives, reduce the loss of female talents in enterprises, and help women to get more organizational support to realize their value. Furthermore, release the nourishment energy of female leader appointments, and play the model effect of current female leaders. Take full advantage of mentor support, career growth plans, and women’s career development programs etc. to help career women improve their ability to deal with exceptional cases and stimulate their motivation and potential. Support women’s career growth, establish incentive models, help female leaders to participate in gender equality initiatives of organizations and society, share workplace experience, and speak out for female groups, thereby enhancing the sense of identity of grassroots women and their perception of group success, and driving the group change. Finally, women should also be aware of the dynamic nature of identities in the organization, and respond to workplace value traps and challenges by adjusting self-awareness, strengthening group connections and seeking social support etc.